So Twitter’s new logo is not so much a new logo design, but it is a sharp looking restyle. Less of a hair-sprayed quiff: more of a rock hard waxed spike style, and I like it very much. Take a look at the last image below where I have overlayed the new Twitter Bird (solid blue) over the old (light tint). Comparing the differences in this way it becomes clear that the restyle was done with great care and reasoning. Everything about the new shape is: improved, simplified and refined, but I’m not just talking about aesthetics here. This little chap is still cute, but it’s stature now has a much greater air of confidence and intent. It’s been sharpened but still retains the cutesy curves. It has now shed it’s duckling fluff and puppy fat curls, and in it’s place a bright, confident and proud adult has emerged. It’s uplifting and wants to encourage you to “speak up and out”. It’s broadcasting up and outward with vigour, enthusiasm and power. Just check the significant change in body language and position: let all hear me that want to hear me. Great great work Twitter. Great work. This is a masterful refresh that is loaded to the hilt with positive meaning. This example shows, in the right hands of course, that a careful and sympathetic refresh of an existing logo mark can provide the most meaningful of results. As Twitter explains: Our new bird grows out of love for ornithology, design within creative constraints, and simple geometry. This bird is crafted purely from three sets of overlapping circles — similar to how your networks, interests and ideas connect and intersect with peers and friends. Whether soaring high above the earth to take in a broad view, or flocking with other birds to achieve a common purpose, a bird in flight is the ultimate representation of freedom, hope and limitless possibility. 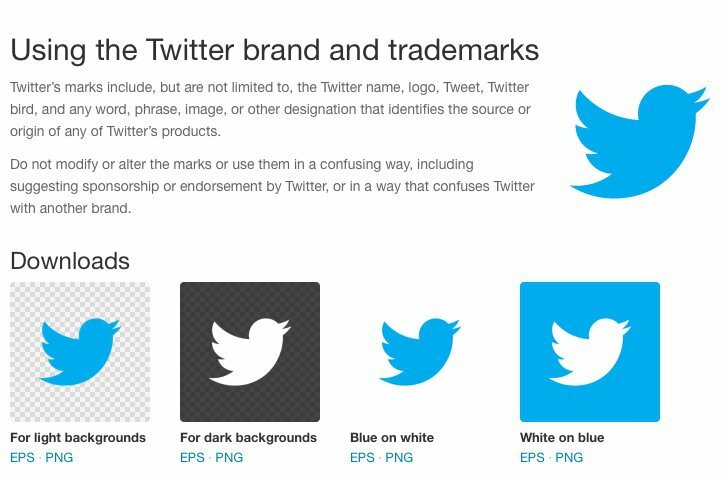 Twitter just hasn’t revised the brand logo as they have made that step from brand name to no brand name. No more will you see the Twitter word mark. I’m personally not sure so on this part of the plan due to the prolific nature of 3rd party generated Twitter birds. The Twitter word mark, at least to me, was just as solid a part of the Twitter brand as the Twitter Bird, but do fully agree that the initial T is surplus to requirements. It’s a always a bold bold move when a brand removes the brand name from the identity, such as Starbucks. If anyone can pull it off then Twitter can. You can visit Twitter’s brand and trademark page to see how the new changes are used in the real world.